South Berwick is a town in York County, Maine, United States. The area was called Newichawannock by the Abenaki Indians, meaning "river with many falls," a reference to the Salmon Falls River. 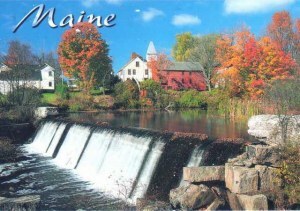 It was first settled by Europeans about 1631 as a part of Kittery known as Kittery North Parish. Near the confluence with the Great Works River, Ambrose Gibbons built the Great House at Newichawannock, a palisaded trading post, to exchange goods with the Indians.